Zoisite crystallises in form of masses and striated prismatic crystals which are, usually, not terminated. The colour range includes colourless, white, and pink (designated as thulite), colourless to blue or purple (designated as tanzanite), yellow, brown, green, and red. This mineral is said to provide for decomposition of negativity and for transmutation of the negative energies to positive force-fields; the positive fields, containing more total energy than the totality of the energy contained in the negativity. 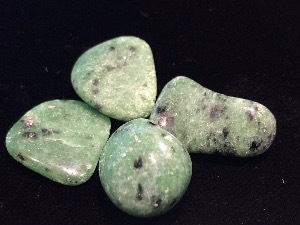 Zoisite may be used to dispel laziness and idleness. Zoisite tumbled to a smooth finish, an ideal pocket size stone, small enough to carry around with you. Tumble Stones can also be placed around the home for their energies or can just be nice decorative items. 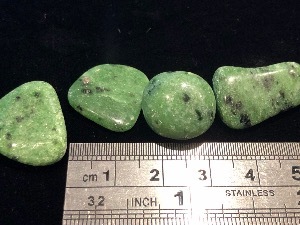 Zoisite crystal gemstones of varying sizes selected specially for your order.